Visit Dr Craig Daly's YouTube Channel to see some of his animation work. A research interest of Dr Stewart White is the ecology of neotropical rainforest birds. There's an exceptionally wide range of basic and applied biological research undertaken at the University of Glasgow. The role of cell and life cycle specific transcription in fission yeast. Chris's area of research focuses on the role of gene expression in controlling progression through cell division cycle, using the fission yeast Schizosaccharomyces pombe as a model organism. He is particularly interested in the transcription mechanisms that control the start of S-phase, and the end of the cell cycle at the M-G1 interval. Fission yeast has a typical eukaryotic cell cycle with discrete and consecutive phases: G1, S, G2 and M. S-phase is DNA synthesis, M phase is mitosis, and G1 and G2 are 'gap' phases between these two. Fission yeast has proved to be an excellent model organism for studying the eukaryotic cell cycle, as many genes and mechanisms first identified in this organism are present throughout the animal kingdom. At the beginning of S-phase a group of at least seven genes, including cdc22+, cdc18+, mik1+, cig2+, cdt1+, and cdt2+ are expressed whose products are required, both directly and indirectly, for replicating DNA. The co-ordinate transcription of these genes is controlled by a transcription factor complex binding to a DNA sequence motif present in the promoters of all the genes. At the start of S-phase the promoter motifs, called MCB (Mlu I cell cycle boxes), are bound by a transcription factor complex called MBF (MCB binding factor; also sometimes called DSC1) containing a number of proteins, including Cdc10p, Res1p, Res2p and Rep2p. Chris is interested in understanding how MBF and MCBs control this cell cycle specific transcription. More recently, Chris's group identified another group of genes that is expressed at the M-G1 interval during the fission yeast mitotic cell cycle. This group contains cdc15+, sid2+, ppb1+ and plol+, all of which have functions late in the cell cycle including cytokinesis and septation. These genes contain a motif in their promoters called a PCB (pombe cell cycle box), which binds to transcription factor complex named PBF (PCB binding factor). 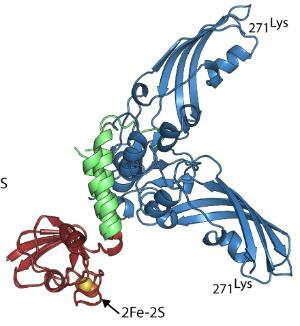 Chris's group has identified at least three components of PBF: a MADS box protein Mbx1p, and two forkhead like transcription factors, Fkh2p and Sep1p. Strikingly, PBF activity and M-G1 transcription are controlled by the polo-kinase Plo1p through it binding directly to and phosphorylating Mbx1p, so plo1+ controls its own expression in a positive feedback loop. This observation is particularly exciting because polo kinases and MADS box proteins are present in all eukaryotes, including humans, and this suggests a new function for these conserved and important proteins. Chris's group is currently working to further understand how Plo1p regulates this group of genes. Cell cycle and cancer. An important part of understanding the basic biology of cancer is to determine how normal cell division is regulated. Yeast is an excellent model system in which to study the cell division cycle as many genes essential for its control, originally identified in this organism, are present throughout nature. It is now known that networks of cell cycle transcription occurs in all eukaryotic organisms, encompassing the whole cell cycle. In some cases the transcription factors are mutated in various forms of cancer. Thus, the ultimate goal of Chris's research is to analyse the role of transcription in cancer biology . McInerny CJ. 2016. Cell cycle regulated transcription: from yeast to cancer. F1000 Res. 5. pii: F1000 Faculty Rev-877. I have been studying the cardiovascular system for over 30 years. My particular interest is in the autonomic (nerve-mediated) control of arteries and veins and, in particular, the interactions between the various cells of the vascular wall. Recent work has focused on the role of fat which surrounds most of the blood vessels of the body. This perivascular fat is thought to contribute to the relationship between hypertension, obesity and diabetes. As a course coordinator (physiology) I have also become interested in the use of animation for teaching physiology. My novel approach is to combine 3D microscopy with Pixar-style animation software. The resulting animations are anatomically correct to within 0.1mm and are therefore not ‘artists impressions’ (unlike most physiology-based animations you will find on YouTube). Daly CJ et al., (2010) Fluorescent ligand binding reveals heterogeneous distribution of adrenergic and ‘cannabinoid-like’ receptors in small arteries. Br. J. Pharmacol., 159, 787-796. Daly CJ et al., (2012). Visualisation and analysis of vascular receptors using confocal laser scanning microscopy and fluorescent ligands. ‘Receptor Binding Techniques’. Humana Press. Ed. A. Davenport. Methods in Molecular Biology 897; 95-107. Bulloch JM & Daly CJ (2014). Autonomic control of Perivascular fat; interactive mechanisms. Pharmacology & Therapeutics. In Press. British Heart Foundation; Studentship (2011- 2013). ‘The role of alpha2-adrenoceptors in alpha1-adrenoceptor null mice’’. Physiological Society. David Jordan Teaching Award. (2013-2014). Creation of anatomically accurate 3D animations for teaching physiology. My research is with the genetically tractable model organism Caenorhabditis elegans. Although moderately dissimilar to humans in appearance, at tissue, cellular and molecular levels there are many similarities. Many genes involved in regulatory pathways associated with human disease processes are conserved in C.elegans; well known examples include components of the RAS, Notch, Wnt and insulin signalling pathways, the regulation of apoptosis and genes associated with Alzheimer's and Parkinson's diseases. With a life cycle of only two and a half days, cultured on Petri plates, transgenic strains created in about a week and a wealth of mutant strains available, it is a powerful genetic system to investigate a broad spectrum of processes. Information on the anatomy of the worm is available at Wormatlas, and WormBook is an excellent online resource with sections covering many aspects of worm biology and research. WormBase is the database for C. elegans. One area of research in the laboratory concerns the analysis of the cancer-associated virus, Epstein-Barr virus (EBV). EBV is a human Herpesvirus that is causal in the development of several forms of human cancer, including Burkitt’s lymphoma, nasopharyngeal carcinoma, Hodgkin’s disease and others. The virus leads to a life long infection, avoiding eradication by the immune system and has evolved intriguing tricks to do this. 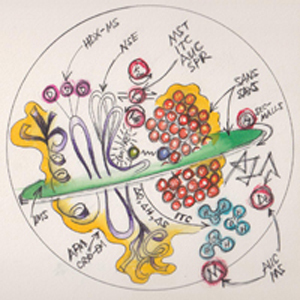 We have developed transgenic models expressing key viral genes in order to investigate their mechanism of action in disease processes and to ask: how do they work to disturb the normal function of the cell, how does this lead to an abnormal cell state, how does this proceed to tumour formation and how does the virus avoid immune eradication? A critical viral gene is the EBV nuclear antigen-1 (EBNA1). It is expressed in all viral associated tumour cells and is essential for viral DNA propagation, as well as enabling cell survival; a property which is likely involved in the development of cancers associated with this virus. EBNA1 represents a prime target for therapeutic design. 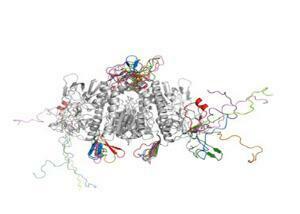 To facilitate this, we have used in silico methods to develop a full structure for the protein. From this we can see how the two monomers of EBNA1 “lock” together to form a stable dimer and how the homodimeric protein binds to DNA (Hussain et al (2014) Virus Genes 49: 358-372). From: Hussain et al (2014) Virus Genes 49: 358-372. 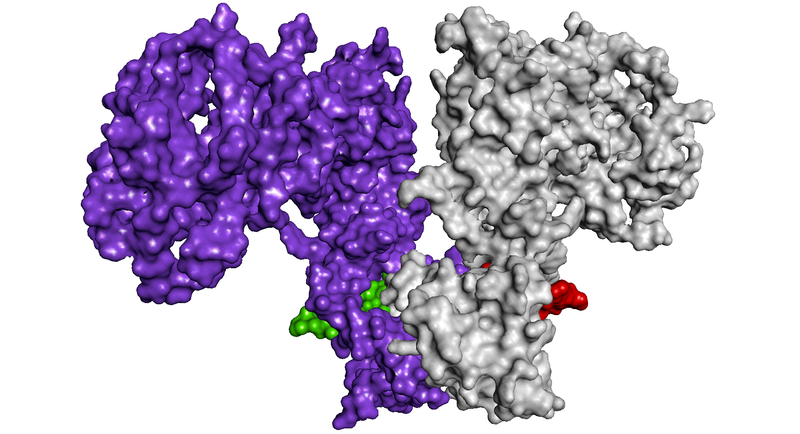 These images show an EBNA1 dimer in ribbon format (above: one monomer in cyan, the other brown), modelled with bound DNA (yellow) and an EBNA1 dimer in surface format (below: one monomer purple and red, the other silver and green), modelled to show the interlocking structure. From: Hannigan et al (2011) Molecular Cancer 10:11 PMID: 21291541 DOI: 10.1186/1476-4598-10-11 (e=epidermis, d=dermis, c=cartilage). 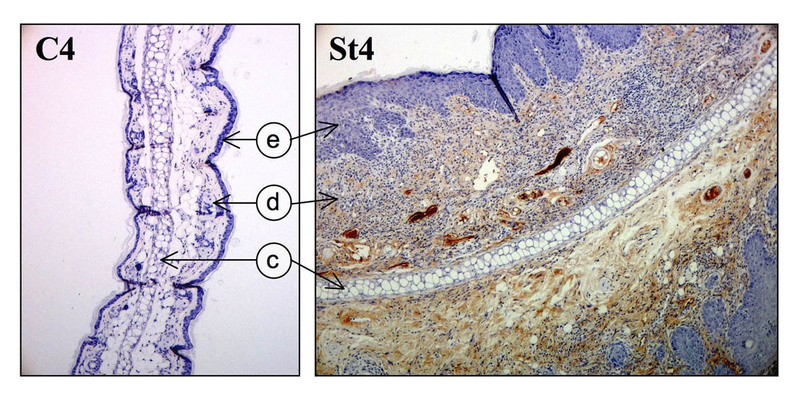 This image shows the extensive deposition of immunoglobulin G (IgG) as part of the inflammatory response, seen as a brown stain in the dermis of a skin section expressing LMP1 (St4) compared to a control (C4). This leads on to another area of active study in the lab. We are exploring the link between chronic inflammation, oxidative stress and cancer. Using a proteomic approach, we have identified a family of proteins, the chitinase-like proteins (Chils), that become hugely upregulated in chronically inflamed tissues (Qureshi et al (2011) Genes and Cancer 2:74-87). We are investigating the role and function of these proteins in chronic inflammation and cancer. 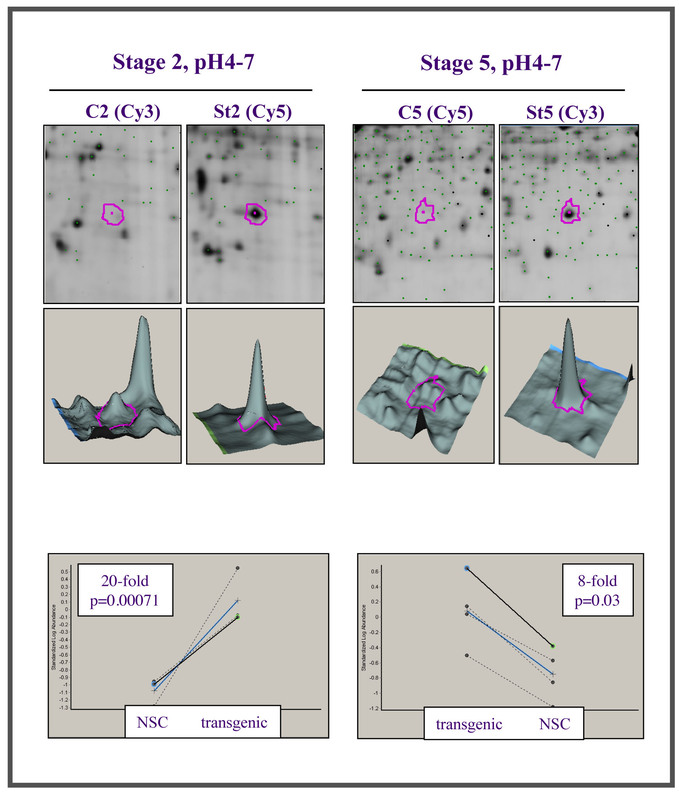 From: Qureshi et al (2011) Genes and Cancer 2:74-87, the data are from a 2D-DiGE study comparing chronically inflamed transgenic tissues (St2 and St5) with controls (C2 and C5 or NSC), to reveal the upregulation (seen as a protein spot (2D) or peak in 3 dimensions, above) of Chil3 and Chil4 (also known as YM1 and YM2) and graphically represented below. I have many research interests, the links between which are sometimes tenuous, or even not there at all. Here is a list with links to descriptions of the projects we currently have underway. Hopefully the list does not go out of date too quickly since I cannot predict what I'll get interested in next . . . .
One of the research projects I am in the process of developing concerns the evolution of milks in mammals, and the milk produced by birds of the pigeon family. This website, Baby Milk Action, concerns the survival of human infants that are endangered by not being provided with the best source of nutrition and protection against infection that it affords, as detailed in some of my lectures. Examples of our work are shown below. Above: Graphical abstract from Byron & Vestergaard (2015) illustrating interplay of biophysical methods in order to fully understand protein-protein interactions. Two proteins are interacting: one depicted as a purple ribbon with flexible N-termini & C-termini and one particularly flexible loop, the other as a dark orange ab initioSANS/SAXS bead model. Other colours are: red - measurable parameters; yellow - surface topology elucidated by AFM or cryo-EM; yellow-green/blue sphere pair - FRET labels; green - collision cross section (CCS) elucidated by IMS; aqua blue - water; pink - surface backbone H exchanged by D. Above: Figure 3C of Laine et al (2015) depicting a homology model for Plasmodium falciparum apicoplast E3 that reveals an extra anti-parallel β-strand at the position where human E3BP (E3-binding protein) interacts with E3; a parasite-specific feature that may be exploitable for drug discovery against PDC. Seven fleximers (coloured differently in the regions that were allowed to flex) are overlaid to illustrate the scope of conformational space explored by the models generated by discrete molecular dynamics modelling. Left: Figure 1 of Rocco & Byron (2015) summarising hydrodynamic models generated from the atomic resolution structure of lysozyme 6lyz.pdb, (C). (A) Bead-shell model generated by HYDROPRO. (B) Tessellated model generated by BEST. (D) 5 Å AtoB US SOMO bead model. (E) Direct correspondence US SOMO SoMo bead model, with overlaps. (F) Same as in (E) after overlap removal. In (D), red and orange are exposed & buried beads, respectively. In (E) & (F) blue: main-chain; cyan: hydrophobic; magenta: non-polar; red: polar; yellow: basic; green: acidic; white: fused beads; orange: buried beads. In an additional paper Rocco & Byron (2015) analysed the comparative performance of these hydrodynamic modelling programs and observed that a combination of SoMo overlapping bead models (E) followed by Zeno computation produced optimal results, with a 0 % average error (range −4 to +4 %). Right: Example of the use of SAXS to complement crystallographic data (taken from Grinter et al (2014)). (Top) analysis of conformational heterogeneity of pectocin M2 reveals compact and extended ensembles in solution. 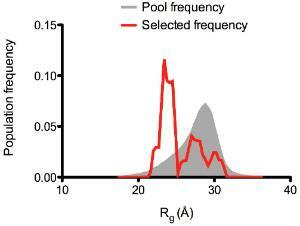 The distribution of solution ensembles (generated by discrete molecular dynamics simulations) selected by GAJOE (in red) from a pool of 5000 random conformers (in grey). Left: The two distinct populations are consistent with the two crystallographic conformations of the molecule. With the increasing pressures being put on the rainforests it is essential that as much information as possible is gathered about the organisms which inhabit these areas. I took part in a long-term capture-recapture study of birds in the Northern Range Mountains of Trinidad between 1988 and 1996 and conducted a smaller study in the south of the island between 1999 and 2001. I hope to return to the island in the near future to follow -up the two studies. I am currently conducting capture-recapture studies of birds at two locations in Ecuador, one in cloud forest at Otonga Reserve in the Cotopaxi Region, the other in varzea and terre-firme forest at Sumaco National Reserve in the Oriente Region. The Sumaco Reserve has never previously been studied and as well as the capture-recapture study I am conducting a basic census of the area using a combination of mist netting, observation and sound recording. Ecology of the Ring Ouzel Turdus torquatus The ring ouzel is a little studied species of migratory upland thrush, which in many areas of its range is in decline. My colleague David Arthur of the Tay Ringing Group has been studying a population of the birds in Glenesk since the 1980's. Numbers in the Glenesk population have been stable over the study period and we are attempting to identify the factors that have allowed this stability. Dragonflies and damselflies are large, spectacular insects and amongst the most ancient of flying insects. The larval stages are voracious and aggressive aquatic predators demonstrating many complex interactions with conspecifics and other organisms. I study these interactions in laboratory conditions by manipulating factors such as diet and presence or absence of other organisms. The impacts of fragmentation and connectivity on the structure and function of aquatic metacommunities are the focus of my current ecological research. I use phytoplankton as a model system fusing/comparing measures resulting from classical microscopic identification techniques with those from recently proposed molecular methodologies (e.g. ILLUMINA). In the framework of the ECOGENE project, we address these questions using a range of spatial scales and employ approaches including: large-scale field sampling (fig 1a), field mesocosms (fig 1b) and experimental laboratory microcosms (fig 1c). This research is relevant for coastal metacommunities such as ecologically important salt-production sites (fig. 2a), interconnected lagoons and salt marshes (fig. 2b), as well as rock pools. Another focus of my research is microalgal ecology. In the IBAHCM lab we maintain an extensive culture collection of algae that are used for experiments on (a) establishing optimal conditions for Harmful Algal Blooms, (b) aquatic toxicology, (c) biofuel research, (d) pigment analysis, (e) uptake rates and other life-history traits.